It is not often Palisade Town Hall shuts down on a weekday afternoon, but this Friday, Sept. 26, the building and offices will be closed for a retirement party. Jim Beougher, long-time Public Works employee, is retiring, and the town and his friends are taking the time this week to thank him for his 28 years of Public Works service. 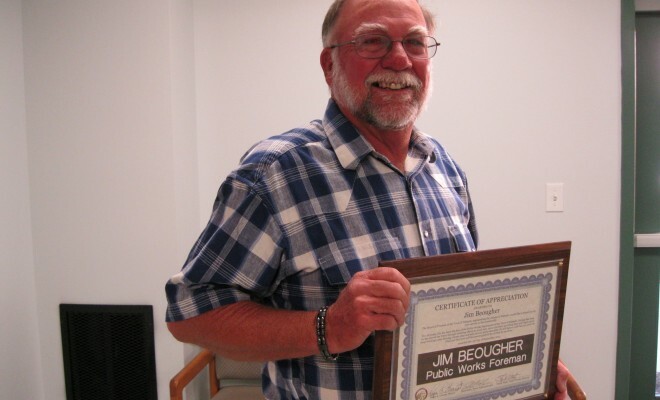 On Tuesday evening, Sept. 23, Beougher was honored at the Town Board meeting with an official commemoration certificate, but Friday’s party will be a more informal celebration, according to Frank Watt, director of Palisade Public Works. “We are going to make him work up to the moment to when he can go to the party, then I’ll tell him to go home, “ Watt joked in an interview about the plans. Town Hall will close at 11:30 so town employees can greet and treat Jim and his wife Margie at the Lions Club pavilion at Riverbend Park for a catered lunch by Texas Roadhouse. “Jim’s favorite place to eat,” Watt pointed out. “Jim knows about his party, and he knows to bring his family. We are having it catered for 70 people (people who have a connection with Jim). “At Friday’s party he will receive some gifts that are more light hearted,” Watt said. “He has 20 years on me. When I took this job as director, his acceptance was key to how quickly I was accepted by the crew, the people and the city officials into this job. Jim was “acting director” when I came,” Watt stated. “We are going to lose a lot of history about the running of Public Works with Jim’s retirement. He knows the people, the town, everything that has been done all these twenty-eight years,” he added. At only 62½ years old, Jim Beougher seems too young to be leaving his life-long occupation as a Public Works foreman, but months ago he and his wife Margie decided to retire from their jobs this year, he said in an interview. He started working in February 1986 as one of three crew members who did everything in the Public Works: the streets, parks, cemetery, pool, water, and sewer. Yes, Jim Beougher has done everything in this job, but now he and his wife Margie want to step away and get away while they are able. Margie retired first. She left her long-time job with St. Mary’s Hospital in the spring. She and Jim have a new 5th wheel ready to travel after he retires officially. They plan to hunt, fish and go see places they have never seen. Jim is counting down the last few days of celebration with mixed feelings, “Overall the years, it was good,” he said. But, he feels strongly. “It was time. We want to enjoy family and go places while we are healthy,” explained Jim.